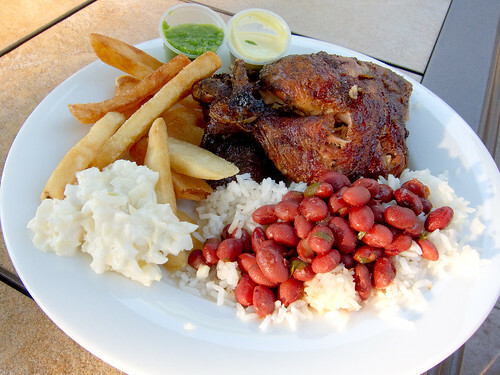 Wheaton, MD is a melting pot of ethnicities and cuisines, and thankfully one of the best Peruvian chicken places in DC. My previous favorite Peruvian chicken place – El Pollo Rico of Arlington, VA – is now closed. It’s not so much that it was better, but that it had rice and beans – a favorite of mine. However, on my most recent trip to El Pollo Rico in Wheaton they had rice and beans! After waiting in line among the bustling dining room, they take your order and quickly butcher your bird with a huge cleaver. Hot sauce, mild sauce, fries, and cole slaw are included. We sometimes add empanadas, plaintains, and now rice and beans. We normally take it to go, enjoying it at home with a few beers. We always order a few extra mid sauces and normally make dinner and lunch the next day out of one chicken. Very yummie! THANKS FOR THIS REVIEW. I USED TO GO TO ARLINGTON YEARS AGO. HEARD THEY WERE CLOSED. SAW THE WHEATON LOCATION AND SAID, NO, THIS CAN’T BE THE SAME PLACE SO I NEVER WENT. I WAS ALWAYS TOLD THERE WAS ONLY ONE LOCATION. IF THE CHICKEN IS STILL GOOD, I’M THERE.